Knit one . . . It's been a busy few years since Jo Mackenzie lost her husband. Life has brought adventure, surprises, unexpected pleasures, and, of course, lots of knitting. Jo's seaside yarn shop, with a brand new café, has taken off, keeping her busier than ever. And being a single mum to two boys and headstrong toddler Pearl is just as exhausting and enchanting as she thought it would be. On top of all that, celebrity diva Grace has a secret; Jo's firecracker best friend Ellen is launching a new television series; and lovable but hapless Martin continues his oft misguided attempts to woo Jo. Just when Jo thinks she has about all she can handle, Daniel, Pearl's globe-trotting dad, turns up out of the blue . 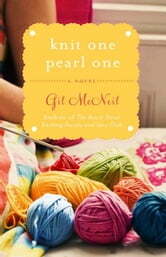 . .
Purl one . . . But with a little help from her friends, and her beloved Gran, Jo is building a new life for herself by the sea, stitch by stitch. Warm and witty, Knit One Pearl One will delight new readers to the Beach Street series and give the legions of existing fans a chance to visit the British seaside again, without having to worry about the weather.